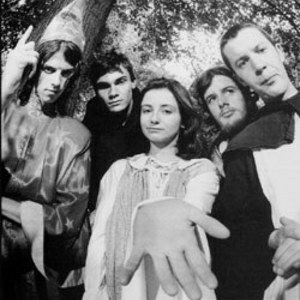 Gorky's Zygotic Mynci were a Welsh psychedelic pop band formed in 1991 in Carmarthen, Wales. The band split in 2006. The band's best known lineup was Euros Childs (vocals, keyboards), his sister Megan Childs (violin, backing vocals), John Lawrence (guitar, vocals), Richard James (bass), and Euros Rowlands (drums). The band was formed by Euros Childs, James and Lawrence whilst still at school, and they have seen a number of lineup changes (perhaps most notably, the departure of Lawrence following 1999's Spanish Dance Troupe) during their existence. The band was well known for performing songs in both Welsh and English. Some of their best known songs include "Patio Song" (1997), "Poodle Rockin'" (1999) and "Stood on Gold" (2001). The band's first release was Patio (1992), a 10" collection of various live, home and studio recordings released on the Welsh Ankst label (this was later expanded for the 1995 CD version). In 1994 their first full studio album, Tatay appeared. Bwyd Time followed the next year - both were produced by Alan Holmes who also provided their colourful artwork. These early releases show a huge range of influences and styles: "Thema o Cartref", the opening track of Tatay, for example, is a relatively gentle harmonium-backed song, while "When You Hear the Captain Sing" appears to be a tribute of sorts to Captain Beefheart and "Amsermaemaiyndod/cinema" presents one song in the right channel and a completely different one in the left. Gorky's also released a number of singles and EPs on Anskt. Running through all the Ankst records is a kind of psychedelia and playfulness evidently inspired by the Canterbury scene of the 1960s and 1970s (Kevin Ayers' album Shooting at the Moon is cited in the notes to Tatay as "the best LP of all time", and the record also includes a version of Robert Wyatt's "O, Caroline"). Bwyd Time in particular also features a wide range of instruments, with parts for the celesta and sitar credited on "Iechyd Da", for instance. The 1996 compilation Introducing Gorky's Zygotic Mynci, their first release in America, was a compilation of this material from the Ankst years. For their next album, Barafundle (1997), produced by Gorwel Owen (who had also worked with the Super Furry Animals) they moved to the larger Fontana label. The wide-ranging instrumentation remained ("Diamond Dew" has a prominent part for the jew's harp) and there were still psychedelic touches, but the album as a whole is more laid back than their earlier work, tending more towards folk music. This gentler direction was largely maintained and refined in their later records, though the occasional poppier and rockier number, such as "Poodle Rockin'" from Spanish Dance Troupe or "Mow the Lawn" from Sleep/Holiday, continued to crop up. Gorky's Zygotic Mynci split up on 26 May 2006, Euros Childs and Richard James having released solo albums. James' is in the folky vein of later Gorky's, wheras Childs' has moments that hark back to earlier moments in their career (so far he has released four albums). And John Lawrence releases as Infinity Chimps. As of Summer 2007, no re-issues of the first 3 albums have surfaced, but Autumn 2007 is a likely date for the expanded & re-mastered Patio.